I took the above picture in a matatu a few weeks ago on my way to work, and it kept me thinking... is this a joke, a sarcastic remark, a decoration or is it just as plain a warning as it clearly is? And as warned, the matatu was blaring with music, just when I needed some peace and quiet. Who loves noisy mornings anyway? So help me God that I get my own car and/or get me a job which has a company bus, both can do, Amen!! I live in the Kenyan 'diaspora', so that tells you the number of hours I spend in traffic in a day. Mind you its both ways that I am in the traffic, and I use matatus daily. I have nothing much against 'mats/nganya/manyanga/mathree' whatever you call them; I mean they have been my mode of transport for most of my life, and I also tend to think it could be a good business venture. BUT please, most of the time the sound levels are too much for my delicate ears to handle. I am still young, I do not want a burst eardrum even before I have my own children... and if you are older, I bet you do not want to experience hypertension as a result of loud music. We all want to age gracefully with our senses still effective, don't we? In my route, we have these 'pimped' mats, with all sorts of graffiti, and décor, its surely a booming business and also an investment, because it is said that it attracts more passengers faster, really? I once read about how "Music blasts from souped-up speakers, strobe lights flash on the inside walls and seat backs and the exhaust pipe is purposely pinched to rev like a motorcycle" as noted by one Gregory Warner of The Daily Life. 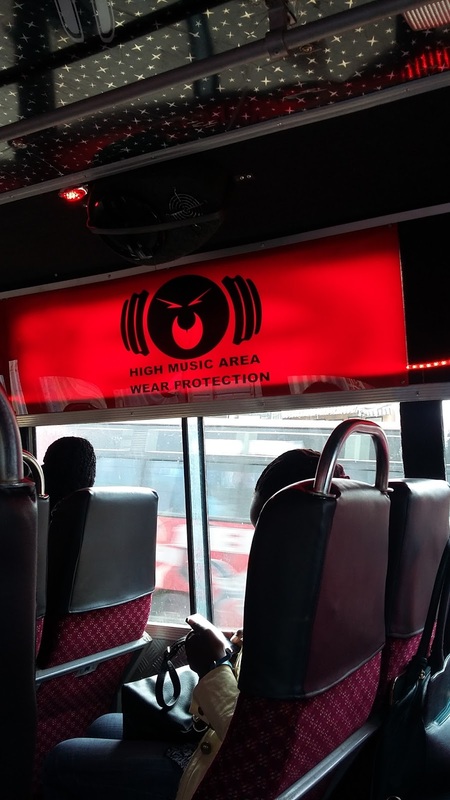 But sadly what I am against these 'souped-up' matatus is mostly the large speakers and woofers, that even vibrate your whole body once the music is turned on. A few years back the music was not that loud in matatus, if there was any that is. However with time, technology keeps on improving and then all sorts of changes have been incorporated in order to attract more passengers who are mostly assumed to be the younger generation- who make up the larger percent of citizens in the country and thus large market- as so believed. 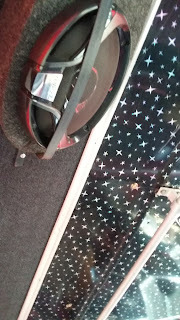 I have even seen stickers in matatus quoted "if its too loud, you are too old" and if you ask the tout to do something about it, it could easily erupt into something else! Matatus sometimes stress me, you have no idea! I have been carrying ear plugs in my bag and the day I forget them I feel doomed! The plugs do not do much anyway, I still hear the music, though I have the notion that they reduce the impact of the blaring sound to my ear drum. I am currently in the search for ear muffs, the type that look like large head phones, if you have any leads please let me know- I am that desperate! Other than my ears, I also tend to get headaches from the noise. Then you can imagine getting into a matatu at 5pm during rush hour and getting to 'diaspora' at 7pm. 2 hours of excruciatingly loud music, I normally feel like am in this survivor reality show, and sometimes I cannot take it, I alight, and get onto a slightly less louder one! Yes, it is that serious. At times am not even in a matatu but when one passes near me I feel the same effect as if I was in it. Many times I have wished the music player could jam in the jam as well, it rarely happens, but when it does I have a grin all the way. My problem is not the music, it is the high sound levels. If played in moderation, safe levels to be specific, I am totally fine with it. I do not think its fair that we are subjected to such, I know many will say there are many other options like taking buses (of which I'll get to my destination the next day) or a personal car (which God will provide very soon for me, Amen!) but still if everyone understood how serious that extremely loud music is for them, this 'pump it up' non-sense would stop sooner than we think. Sounds that are not at safe levels can be harmful, even for a brief time, and even worse when they are both loud and long-lasting. Exposure to these loud sounds and when repetitive can cause hearing loss among other problems such as hypertension, head aches and increased stress levels. Other than that, noise is also a threat to both aquatic and terrestrial ecosystems by upsetting wildlife.